We are delighted that we have retained our PLATINUM Eco Schools flag, for a third year running. It is a fantastic achievement and we are proud of the hard work and commitment of the whole school community. We are so lucky to have been able to purchase 2 bee hives along with 20,000 bees. The bees are thriving and are cared for by Mrs N Pryce and Mrs R Davies, along with the help of Eco-Club. We are passionate about bees in our school and the importance of them in our Eco-System. 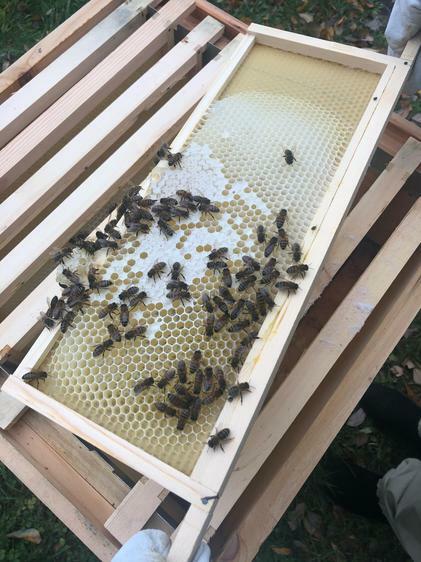 We hope to harvest our own honey soon! We are now a Fair active school! We have raised the status of Fair Trade in our school and have started to take action! Members of Eco-Club and year 6 were lucky enough to meet two men from Uganda at the town council chambers. These two men work for a Fair Trade coffee corporation and told us lots about what they do. We also enjoyed hearing about life in Uganda. We are working towards becoming a Fair Trade School. Eco-Club enjoying pond dipping in the River Llynfi. They found lots of creatures and realised how clean the River Llynfi is! Making feeders to help our furry and feathered friends through the winter months.